Their scheme was disrupted by a lack of funds, the war with Mexico and the statehood of Texas. The German homesteaders stayed anyway. 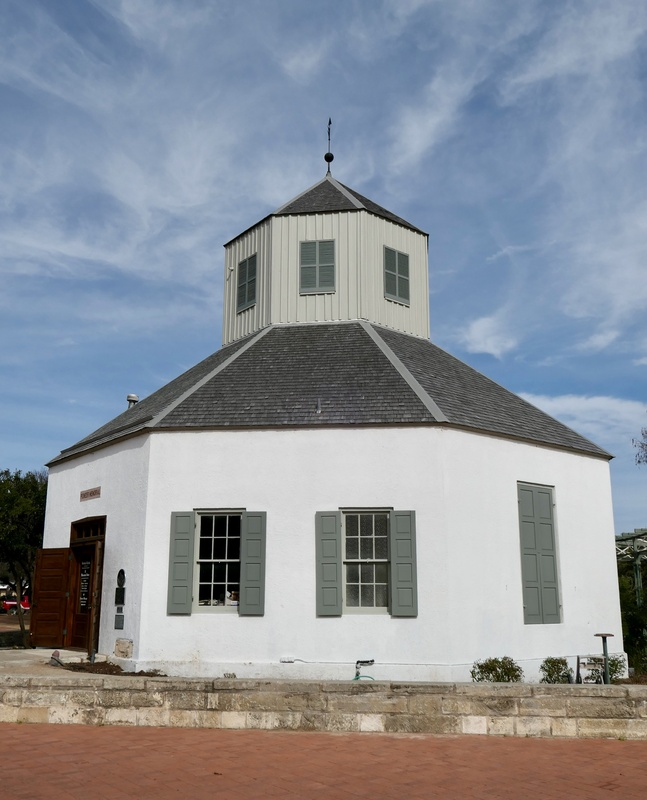 They founded several Texas communities, such as Bulverde, New Braunfels, Boerne, Walburg, Comfort, Schulenburg, Weimar and the town where I stayed, Fredericksburg. It’s named after Prince Frederick of Prussia. Texas Hill Country is defined by craggy hills, rocky fields and limestone caves. The landscape rolls with dry, yellow grass and gnarly trees, including live oak, juniper, mesquite and hickory. Hill Country’s border is blurry, but twenty-five counties in central and southwest Texas claim membership. On the way out of Austin, I passed old stone farmhouses and fancy ranch gates. I counted more goats and sheep than horses and cows. Near LBJ’s ranch, I crossed the Pedernales River. North of Fredericksburg is the Enchanted Rock State Natural Area. The Rock is a huge pink-granite dome, protruding nearly two-thousand feet above the surrounding plain. One billion years ago, the Rock-to-be was a hot pool of liquid minerals seven miles below the earth’s surface. The globular mass pushed to the top, cooled and hardened. The climb to the crown of the dome was short, but steep. In some places I had to scramble over rocks, but once above the boulder field, walking was easier. The granite surface provided sure-footed traction. At the broad, bald summit, the view was three-hundred-and-sixty degrees. In Fredericksburg, I checked into the Bed & Brew. That’s right, I slept in a brewery, specifically the Bordello Room, which did not turn out to be as exciting as the name suggested it might. The hallway was permeated by the aroma of the hops, barley and yeast cooking downstairs. Hill Country is known for peaches, pecans and grapes. Due to its climate, the area is most successful with Spanish and Italian grape varieties, such as tempranillo and sangiovese. Texas is the fifth largest wine-producing state in the United States and the Hill Country American Viticultural Area is the second largest in the nation. Five-million people visit its fifty-two wineries each year. I sampled a flight at Becker Vineyards. Fredericksburg’s main street is lined with German restaurants, wine shops and biergartens, many with Willkommen signs. Among my options for dinner were Der Lindenbaum, Auslander, Friedhelm’s Bavarian Inn, Altdorf Restaurant & Biergarten, and Otto’s German Bistro. Even the burger joints serve schnitzel. The town has long blocks, wide streets and interminable traffic lights. The first letters of sequential street names cleverly spell words: Adams, Llano, Lincoln, Washington, Elk, Lee, Columbus, Olive, Mesquite and Eagle. The streets to the west are Crockett, Orange, Milam, Edison, Bowie, Acorn, Cherry and Kay. In the Marktplatz, I stepped inside the small, octagonal Vereins Kirche, a replica of the first church built after the settlers arrived. Nearby, the Pioneer Museum proudly displays the town’s German heritage. The complex features settlers’ homesteads, some in their original locations, such as the Kammlah house, smokehouse and barn. Four generations of Kammlahs had lived in the house before the museum purchased it. 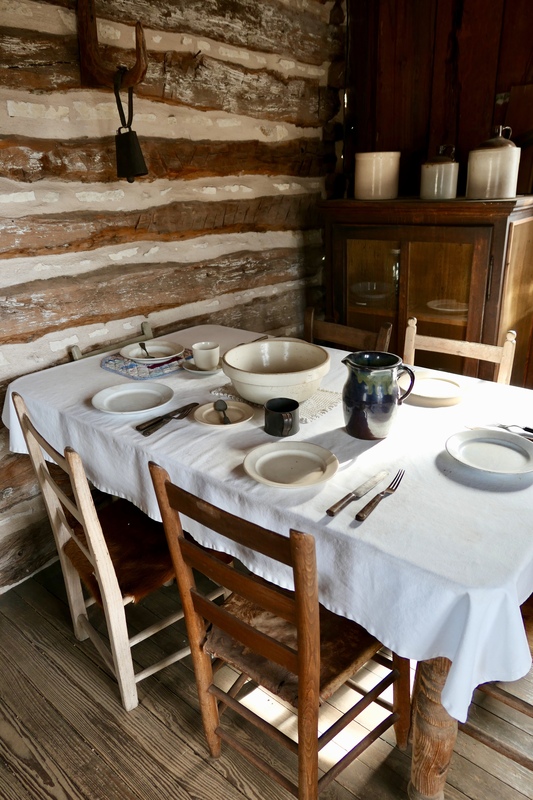 As I stepped into each room, my movement triggered an audio recording narrated by a great-great- or great-great-great-grandson or daughter of one of the early pioneers. “Guten Tag,” some began. For a couple of generations, German was the only language spoken within the communities. A dialect called Texas German developed, incorporating a few American words. The onset of World War I finally required that English be taught in the schools. Linguists believe the Texas-German dialect will be dead by 2040. After breakfast at the Alt Deutsch Bäckerei, I day-tripped south, stopping first in Kerrville, a pleasant town with an extensive park system along the Guadalupe River. There, I visited the Museum of Western Art, formerly the Cowboy Artists of America Museum. The museum features the work of living artists who specialize in themes of the American West–in other words, cowboys and Indians. On to Bandera, which bills itself as the Cowboy Capital of the World. The town delivers on its promise with reenacted gun fights, main-street cattle drives, rodeos, dude ranches and honky-tonk bars. I toured the Frontier Times Museum, an overflowing, unorganized collection of western antiques and curiosities, including fossils, ranching tools, war memorabilia, currency, knots, barbed wire, taxidermy, shrines to local rodeo heroes, and a stuffed two-headed lamb. I saw few cows in the Cowboy Capital, but several exotic animals, including oryxes, blackbuck and emus. Texas is friendly toward the breeding of exotics for the purpose of hunting. It’s a $1 billion industry. As many as 1.3 million exotic animals may currently reside in Texas, the majority of them in Hill Country. Historic Fort Verde once hosted exotics of its own. In 1854, Secretary of War Jefferson Davis (later to become president of the Confederacy) asked Congress for funds to experiment with the use of camels as military pack animals. The bill was approved and, in 1856, thirty-three camels arrived at Fort Verde from the Middle East. Forty-one more arrived a year later. The camels passed every test, carrying loads up to four-hundred pounds, climbing steep mountains, covering up to thirty miles per day, and lasting for days without water. They easily outperformed mules, horses and oxen. The experiment ended with the start of the Civil War. The fort was deactivated in 1869. Many of the camels went to circuses and zoos, but a few escaped into the wild. For years, people reported seeing them in the Chihuahuan Desert of Big Bend and Mexico. German immigrant Charles Henry (born Karl Heinrich) Nimitz came to the United States in 1844. 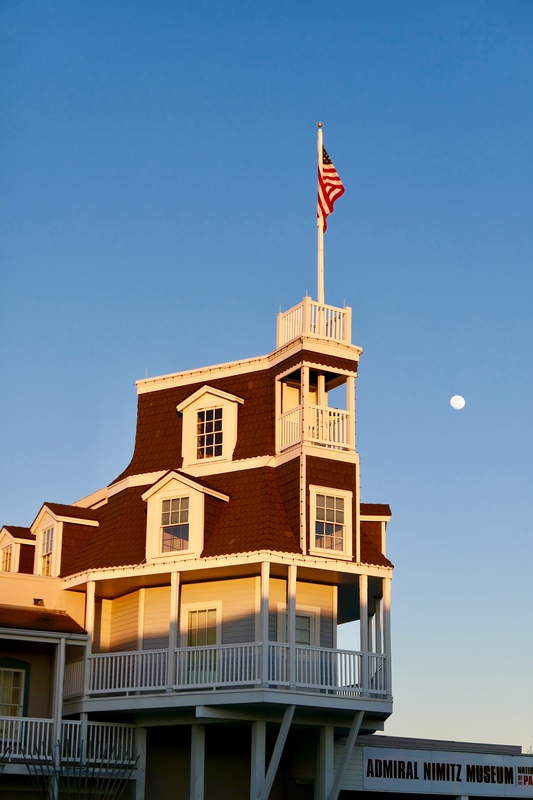 He built the regionally famous Nimitz Hotel in Fredericksburg. Guests included Horace Greeley, O. Henry, Robert E. Lee, and presidents Rutherford Hayes and Ulysses Grant. One hundred years later, his grandson, Chester Nimitz, was appointed Fleet Admiral, the highest grade in the US Navy. Grandson Chester was born in Fredericksburg in 1885. His birthplace still stands across the street from the Nimitz Hotel. 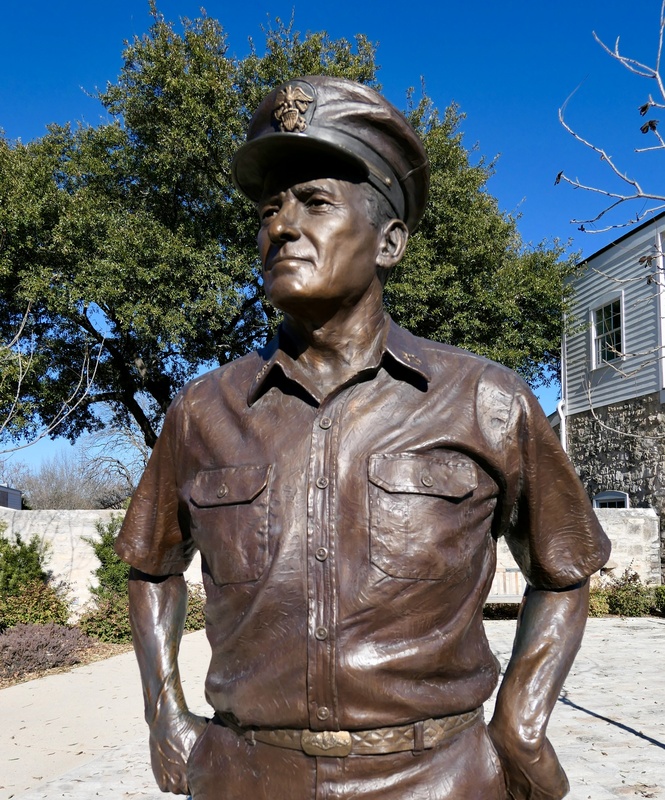 I toured the Admiral Nimitz Museum, located within a replica of the old hotel. Next door is the six-acre National Museum of the Pacific War. The exhibits exhaustively detail every incident, skirmish and battle that occurred in the Pacific theater during World War II, from before Pearl Harbor to after Nagasaki. I lost my ability to focus somewhere around the Guadalcanal Campaign–and there were still two years to go. The museum wisely issues tickets that are good for forty-eight hours. I grabbed coffee at Java Ranch, where the counter is decorated with Christmas lights made from spent shotgun shells, and began my driving tour east. I passed several herds of white-tailed deer and nearly collided with two of them. A wake of nearly fifty vultures feasted on a previous hit-and-run victim. 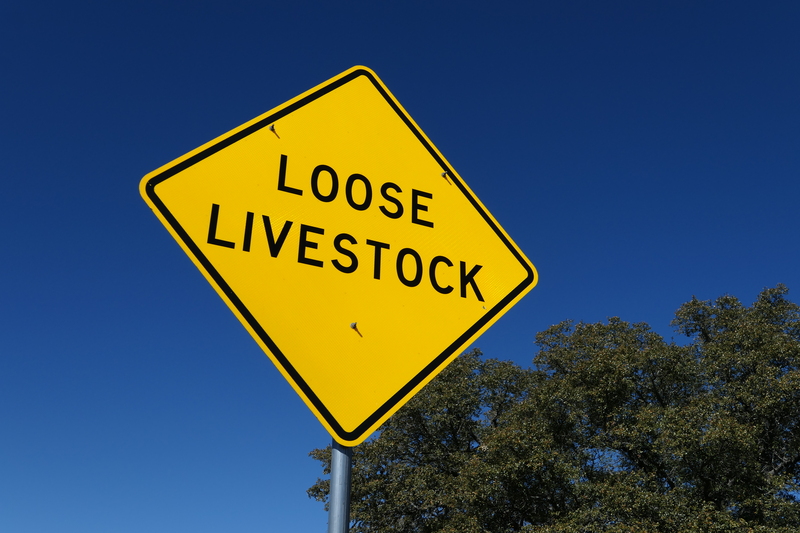 The Insurance Institute for Highway Safety says Texas is the most hazardous state in the country for vehicle-animal crashes. The sommelier at Becker Vineyards told me the county employs an “unnatural predator” to shoot a quota of three deer per day in an effort to reduce run-ins with cars. On to Gruene, another German settlement. In the mid-1800s, the community was centered around a busy cotton gin, general store and dance hall. The original hall still stands and anchors a tourist destination of B&Bs, restaurants and shops. 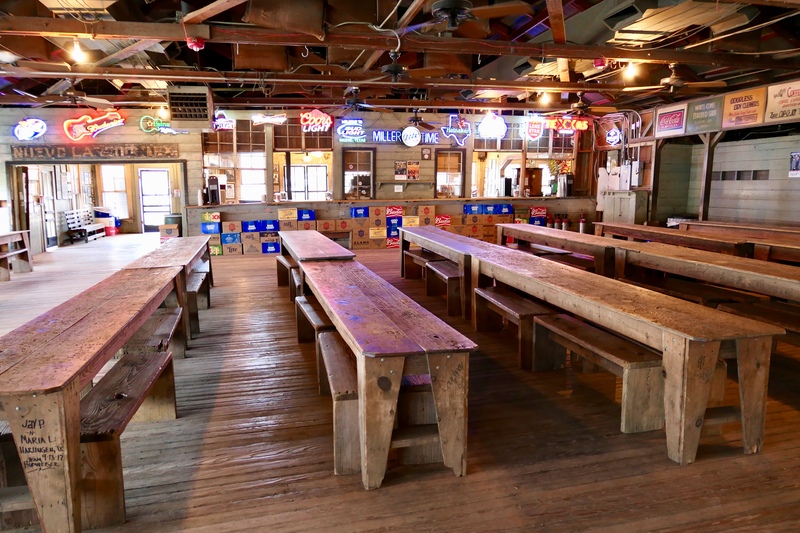 Gruene Hall is Texas’s most famous and oldest continually operating dance hall. Not much has changed since it was built over 130 years ago. 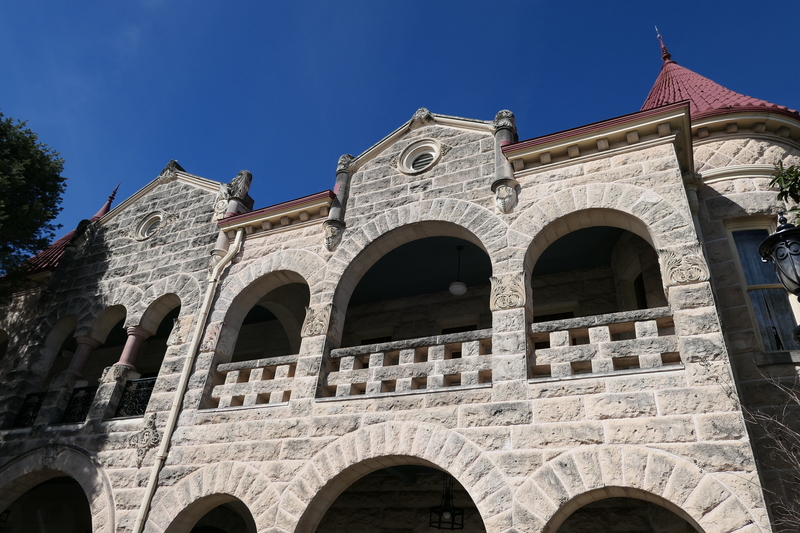 It serves as a community center, bar, sometimes-movie set, and concert venue. The old hall has hosted hundreds of musical artists over the years, including Merle Haggard, Kris Kristofferson, Jerry Lee Lewis, Dierks Bentley, Loretta Lynn, Miranda Lambert, Bo Diddley, Aaron Neville, B.B. King, Buddy Guy, Willie Nelson, George Strait, Little Richard, and Hootie & The Blowfish. Scenes from various movies have been filmed inside, including the dance scene in Michael, starring John Travolta and Andee MacDowell. After Gruene, Luckenbach seemed the obvious next stop. 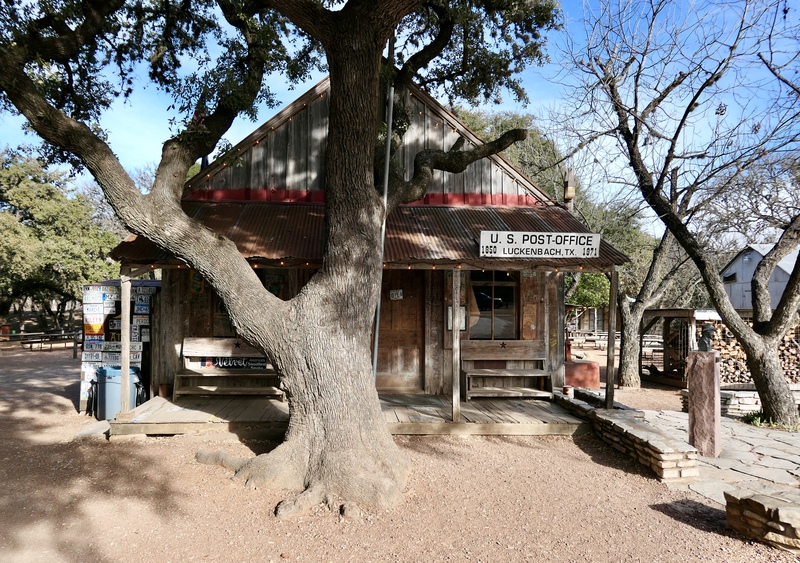 Luckenbach was established in the mid-1800s as a trading post, serving both ranchers and the Comanche. By the 1960s, it was a ghost town. In 1970 Hondo Crouch and a few friends bought the town, including the general store and dance hall. Crouch has been described as a humorist, writer, clown prince and folk hero. His zany brand of self-effacing promotion may have attracted country-folk-rocker Jerry Jeff Walker to Luckenbach. Walker is best known for his song “Mr. Bojangles.” In 1973, Walker and The Lost Gonzo Band recorded the live album Viva Terlingua in the dance hall, putting a progressive honky-tonk and swing spin on several Texas classics. The album defined “outlaw country” and reportedly sent a chill through the corporate music industry in Nashville. A few years later, Waylon Jennings and Willie Nelson recorded “Luckenbach Texas (Back to the Basics).” It reached number one on the country charts. 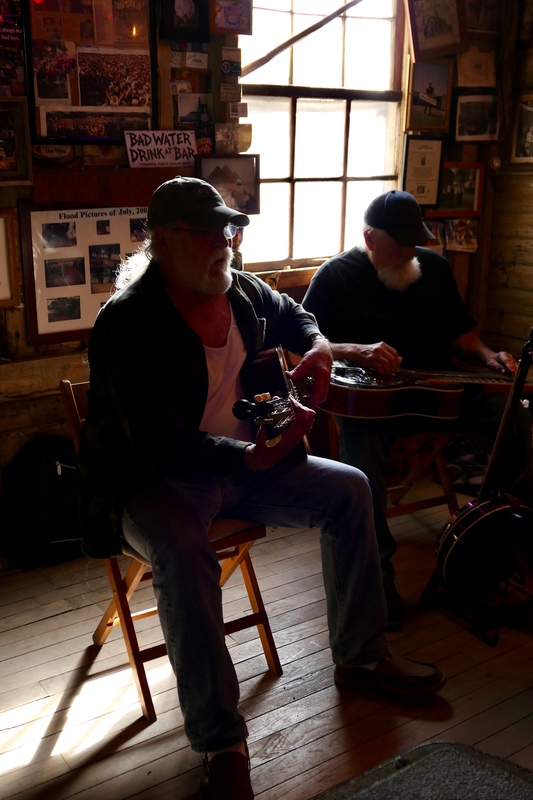 Since then, Luckenbach has become a must-visit stop for music fans. For years, Willie Nelson held his annual Fourth of July picnic on the outdoor stage. The venue regularly hosts concerts by top country, folk and rock entertainers. Once in a while the bartender joined on harmonica, while simultaneously serving Lone Stars and Shiner Bocks. As you might have noticed, I am a “Prost” girl. I may have to add “y’all”! Who knew there was such a German history? Thanks for the tour. Looking forward to hearing more. Great post! 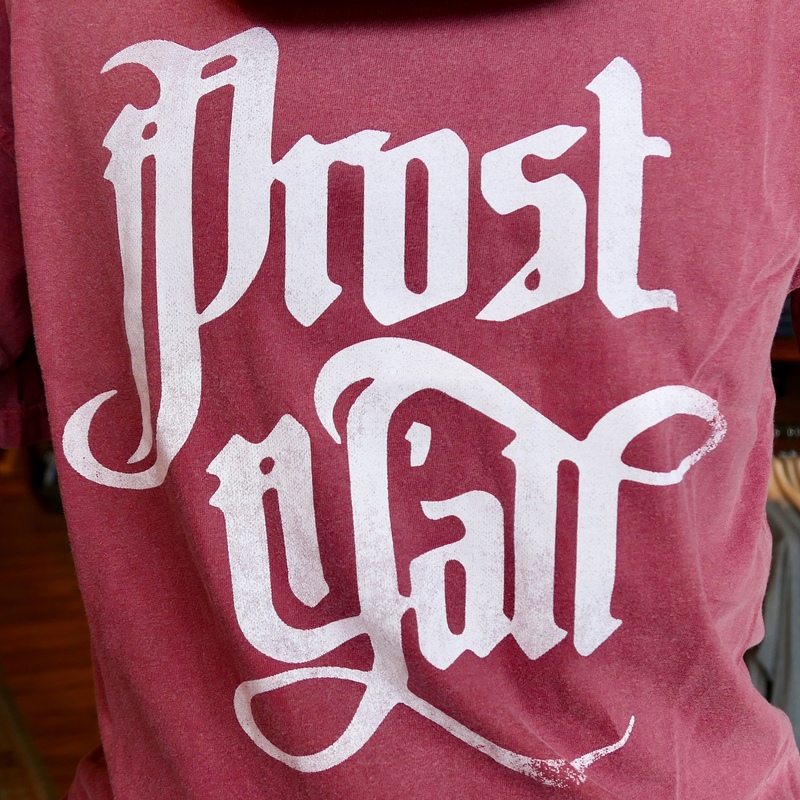 And I love the culture clash with “Prost y’all”! I enjoyed reading about your Hill Country adventures. So glad you enjoyed that area. We do too! We failed to mention that Ervin’s sister lives outside of Bandera on a few acres. With a name like Kliesch, how could we not enjoy the details of the German tour? Well done! Did you find good sausage and/or hotdogs? A culinary passage, no doubt. Probably good beer too. Headed next to? Is that car running well? You haven’t owned one of those in a few years!